The team collaboration features are supported partly by Visual Paradigm Online ("VP Online"). In order to use the collaboration features, you and your teammates have to be a member of Visual Paradigm Online. Read this page to learn how to sign-up VP Online for free. 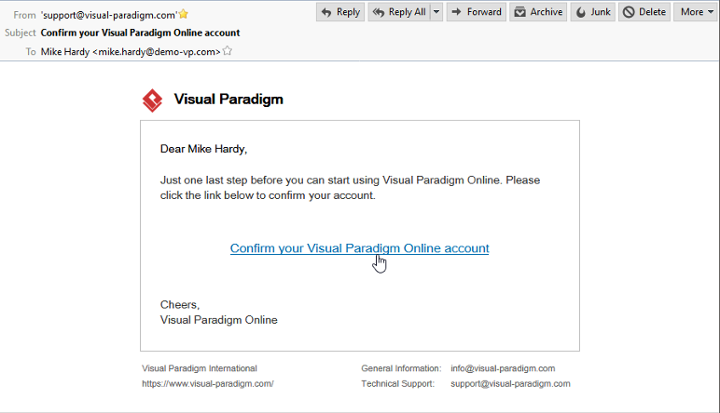 In the Sign up Visual Paradigm Online window, enter your email address and password. Fill-in the subdomain to complete the Cloud entry point. Cloud entry point is the URL where you and your teammates can visit to log in to your account. It is unique to your team, so we recommend you fill in your company or team name here. A confirmation email is sent to you and it should arrive within 10 minutes. If you haven't received the email after a good while, please check the junk folder of your email client. Click on the confirmation link in the email. A web page is opened, telling you that your account is activated. Enter the name of the repository, which is preferably the name of your company. Then, enter your name and password. From now on, you can create and manage members and project through the web interface of Visual Paradigm Online. Project creation can also be done from within Visual Paradigm Desktop.